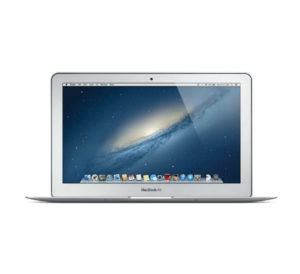 MacBook Air 5,1 (11-inch, Mid 2012) is powered with a dual Core i5 (3317U) and Intel HD Graphics 4000 integrated graphics processor with 384 MB of shared DDR3 memory. It features 4 GB of RAM, a 64 GB \ 128 GB flash storage. The widescreen TFT LED backlit active-matrix display has 1366 x 768 native resolution and a glossy surface. This model has an inbuilt FaceTime video camera with 720p resolution and two stereo speakers placed under the keyboard for multimedia and AirPort Extreme (802.13a/b/g/n) port and Bluetooth 4.0 for communication. Two USB 3.0 ports, analog audio out and Thunderbolt video\audio out with external display support sum up the connectivity options. MacBook Air 5,1 Core i5 1.7 (11-inch, Mid 2012) lacks Firewire, Ethernet (with an external adapter available for an extra cost), and optical audio in/out. MacBook Air 5,1 Core i7 2.0 (11-inch, Mid 2012) is the build-to-order but later standard iteration of MacBook Air 5,1 Core i5 1.7 (11-inch, Mid 2012). Processor speed: 1.7 GHz (optional and later standard, 2.0 GHz). Processor type: Core i5 (3317U) “Ivy Bridge”. Optional and later standar Core i5 (3667U) “Ivy Bridge”. Display: 11.6-inch LED-backlit TFT active matrix IPS, 16:10 widescreen, 1366 x 768 pixels max resolution. Storage: 64 GB \ 128 GB SSD. Battery: inbuilt lithium-ion polymer, 35-watt-hour. Internet \ Wireless connection: inbuilt AirPort Extreme (802.13a/b/g/n), Bluetooth 4.0. Apple Number: A1465 (EMC 2558). Setup Assistant: When you start your MacBook Air for the first time, Setup Assistant will help you get going. Just follow a few steps to quickly connect to your Wi-Fi network, transfer your stuff from another Mac or a PC, and create a user account for your Mac. You’ll also be able to log in with your Apple ID, so you can download apps from the App Store, shop the iTunes Store and the Apple Online Store, access iCloud, and make video calls with FaceTime. If you don’t have an Apple ID, creating one is easy and free. It’s easy to move files like documents, email, photos, music, and movies to your new Mac from another Mac or a PC. The first time you start your new Mac, it will walk you through the process step by step. All you have to do is follow the onscreen instructions. Multi-touch gestures: You can do a lot of things on your MacBook Air using simple gestures on the trackpad. Here are some of the most popular ones: Click – Press down anywhere on the trackpad to click. Or, with Tap to Click enabled, simply tap the surface. Secondary click (right click) – Click with two fingers to open shortcut menus. You can also, with Tap to Click enabled, tap two fingers anywhere. Swipe to navigate – Swipe with two fingers to flip through web pages, documents, and more. Double click – Press down two times anywhere on the trackpad. Or, with Tap to Click enabled, double-tap the surface. Two-finger scroll – Brush two fingers along the trackpad to scroll in any direction-up, down, or sideways. Smart zoom – Double-tap the trackpad with two fingers to quickly magnify a web page. Pinch to zoom – Zoom in and out of photos and web pages more precisely by pinching your thumb and finger. Switch between full-screen apps – Swipe with three fingers to move from one full-screen app to another. View Launchpad – Pinch with four fingers to view all your apps in Launchpad. Rotate – Turn your thumb and finger clockwise or counterclockwise to rotate an image. View Mission Control – Swipe up with three fingers to see every open window on your Mac. Choose System Preferences from the Apple menu and click Trackpad to learn more about multi-touch gestures. Desktop: The desktop is where you can find everything and do anything on your MacBook Air Core 5, 1. The Dock at the bottom is a handy place to keep the apps you use most. It’s also where you can open System Preferences, which lets you customize your desktop and other settings on your Mac. Click the Finder icon to quickly get to all your files and folders. The menu bar at the top has lots of useful information about your Mac. To check the status of your wireless Internet connection, click the Wi-Fi icon. Your Mac automatically connects to the network you chose during setup. MacBook Air 5,1 (11-inch, Mid 2012) revisions includes USB 3.0 ports, MagSafe 2 and a faster Ivy Bridge processor capable of boosting. Other hardware and its layout remains the same. Due to the fact, spare parts and batteries from 2011 and 2010 models can be used in repair. The new MagSafe 2 connector is much thinner and wider than its predecessor. A $10 MagSafe 2 adapter is available for an extra price from Apple store. The RAM and SSD capacity could be enhanced at a time of a purchase only. Some sources indicate, MacBook Air 5,1 (11-inch, Mid 2012) has flash storage, but it’s the wrong way to put it. This model runs on solid state drive or SSD for short, that consists of flash memory but is in itself a more complicated storage. SSDs for MacBooks Air are fabricated by Toshiba. For Wi-Fi and Bluetooth Broadcom chips are used. We help you save Money: Sell your old and used MacBook to iGotOffer for the best price online! : Macbook sale. Free instant quote, free and fully insured shipping, fast and secure payment.